In consideration of the economic development policies that determine health conditions among indigenous populations, Suriname Indigenous Health Fund (SIHF), and the Organization of Guiana Aboriginal Nations (ONAG) signed an agreement on 13 November 2015 to collaborate on projects that aim to establish a new social contract between all sectors of government and civil society to advance human development that is sustainable and equitable, and to improve health outcomes. ONAG and SIHF have issued the following Joint Declaration to solve complex problems using non-violent communication and find mutually beneficial solutions in government and civil society to improve the health and well-being for all. In August, 2015 a six-person team visited with communities in Suriname and French Guiana along the Maroni river collecting human rights testimony to take to the Organization of American States Human Rights Commission. This video is a short segment from the trip and gives an overview of the problems the Indigenous Wayana face as a result of mining pollution and the threat to their lands by development activities. Indigenous people living traditional lifestyles in Suriname’s interior region face an eminent threat to their health and very existence. Economic development activities, including land privatization and resource extraction, take place on their traditional lands without their consent. Food and water contamination caused by infrastructure development activities that build dams and roads, and resource extraction activities such as gold mining, cause significant public and environmental health problems. Communities are displaced directly by these activities and indirectly when they are forced to abandon their communities when they are no longer able to access their traditional sources of food, fiber, and medicine. In partnership with indigenous people in transition from their traditional lifestyle to one based on a Western money-based economy, the Suriname Indigenous Health Fund collaborates with an international team to give communities access to the tools and expertise they need to address, for themselves, the challenges that they face. SIHF affirms self-determination by supporting indigenous communities as they define their own priorities and initiatives concerning private and governmental land development programs impacting their health and traditional way of life. The focus of SIHF includes human rights, land rights, the social determinants of health, community health and environmental health. Knowledge and information empowers people to become vocal participants in the political decision-making process. 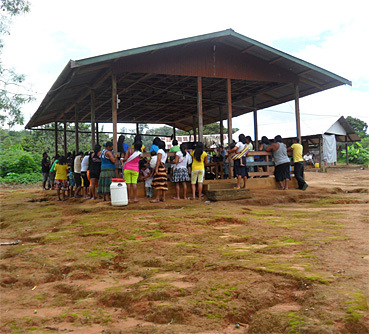 We provide the indigenous people in Suriname with the materials and technical support they need to negotiate and apply pressure for socially and environmentally responsible activities in their own territories. Informed communities are able to demand and shape transparency and accountability in the activities of governmental and nongovernmental organizations. This is the first step in gaining control of the research and intervention process and improving the quality of life of their communities. The desired outcome of the work of SIHF is to ensure that government policies, regulations, and laws that affect Indigenous Peoples comply with international conventions and, in particular, conform to the United Nations Declaration on the Rights of Indigenous Peoples. Five Amerindian groups (Wayana, Carib, Arowaks,Trio, and Akurio) and five culturally distinct groups of Maroons (Ndyuka or Aukaner, Saramaka, Paramaka, Aluku or Boni, and Matawai) live along the main rivers in Suriname’s Greenstone Belt region. Mercury and Cyanide pollution generated by mining contaminate all available food and water. Deforestation, caused by mining and logging destroy traditional medicines, hunting grounds, and the materials used to construct homes. International fiscal policies that favor land privatization provide multi-national corporations direct access to “raw materials” on indigenous peoples’ traditional lands. Unprotected by environmental laws, land rights, or legal recognition, Indigenous Peoples face extinction. Miners adding mercury to sleuce box to amalgamate gold. 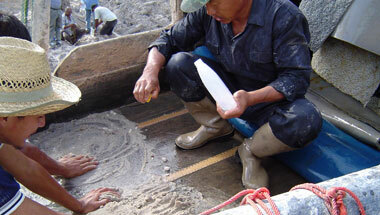 Since the early 1990s there has been an explosive increase in gold mining activities in Suriname. It is estimated that between 10 and 60 metric tons of mercury are used in mining and released into the environment in Suriname each year. The indiscriminate use of mercury throughout the process is causing irreversible damage to the Environment and exposes both miners and the general population living in the region where mining occurs to toxic levels of mercury. Hair analysis results indicate that the general population living in areas where gold mining occurs may be exposed to mercury. Mercury levels found in human hair in the volunteers from the southeast region of Suriname ranged from 2 to 15 ppm. Clinical signs of mercury toxicity were observed including ptosis, and impaired hearing, sight and speech.